Managing Director, Narinder recently turned 50! We hope you had a fab birthday. 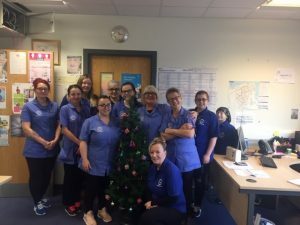 Congratulations to all the Care Worker of the Month nominees, Robert Dickinson, Kayley Benson, Hazel Bowler, Janet Burns, Caroline Herbert, Kaylee Rikey, Diane Ludford, Emma Capon, Radka Kozielova, Manjinder Mattu, Tahseen Hussain, Katelyn MacVicar, Shannon O’Connor, Fiona Duncan, Patricia Cova Duarte, Pauline Powell, Olwen Worland, Demise Murphy, Ruth Owen, Melissa Brady, Alex Salmon, Alexandra Fabian and Steph Brereton. Congratulation to Care Quality Manager, Kathryn Marshall, Training Team Leader, Liam Murphy and Care Coordinator, Nicola Tyler for receiving long service awards for being with Allied for 10 years! Head of Operational Excellence, Helen Matthias will also be receiving the award for 15 years of service! The Fraserburgh carers enjoyed their Christmas with an excellent Xmas party. 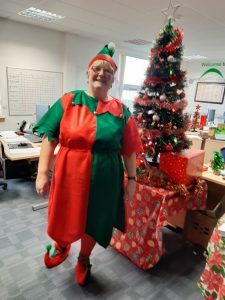 The team were enjoying the festivities before Christmas especially elf, Christine Cassidy, Coordinator for East Lothian. 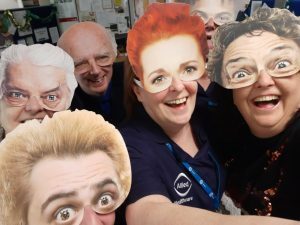 The team received these excellent masks as a xmas presents from their manager! 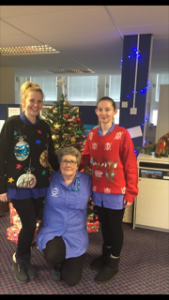 The office team in the Isle of Bute had some amazing Christmas jumpers!